End of the Year Survey. Happy New Years Eve. I would have to say either Amy and Roger's Epic Detour by Morgan Matson or The Unbecoming of Mara Dyer. Two awesome books, I highly advise you to check out. Oh gosh, I'd really not like to diss a book, but I'd have to say Imaginary Girls. It just wasn't that good of a book. Lots of people rave about this book, but, sorry, guys it was very, very sad. I'd have to say...Hmmm...Divergent. I didn't think I'd get into it as I did. Very Harry Potter-esque. Oh, and then there is Wintertown. I didn't think I'd like it as much as Happyface, but it wowed me. The Lying Game, most definitely. I kinda fell off the Clique series a bit, but it's still good and I'd have to put in the AirHead series by Meg Cabot. Lisa Schroeder, John Greene, Veronica Roth, Michelle Hodkins, Holly Black, etc. He's Just Not That Into You. It was the first self-help book I'd ever read and, frankly, I loved it. I loved Mara, Jamie and Noah from Mara Dyer. Especially Noah, if you know what I mean. ;) I liked Kat from Uncommon Criminals, too. They were HI-LARIOUS and fun to read along with. If I Die by Jenny Downham. This book...Man, this book, it made me look at things in a whole nother perspective. A MILLON SUNS by Beth Rivis! 17. Book That Had A Scene In It That Had You Reeling And Dying To Talk To Somebody About It? (a WTF moment, an epic revelation, a steamy kiss, etc. etc.) Be careful of spoilers!The endings of The Unbecoming of Mara Dyer and Wanted by Sara Shepard. Also, just, Paradise Rules as a whole. 18. 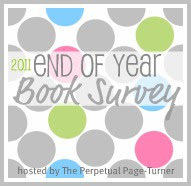 One Book You Didn't Get To In 2011 But Will Be Your Number 1 Priority in 2012? Probably, Unearthly and also Beautiful Darkness. Most definitely Across the Universe. I know we're all happy about that one. And just reading more in general. So, that's that and have a Happy New Years Eve!